I remember when you were born and the thought of you starting school seemed ages away. These past four years seem to have flown by and and I can't believe the time has come for you to start school. You finished pre-school a couple of weeks ago now and you loved your graduation with your friends. It made me emotional seeing how far you had come in just a year and all the friendships you had made. In just 4 weeks' time you will start a new adventure and I know how excited you are to start school, as you're a 'big girl' as you keep reminding me! I'm trying to make the most of the next four weeks, as I know once you start school I will miss you being around. It's been just you and me at home during the week for the past four years while Daddy went to work. It's certainly going to take some getting used to, doing the school run every morning. I know once you start school you will seem even more grown up. You're still my baby and I'm not ready to let you go just yet. 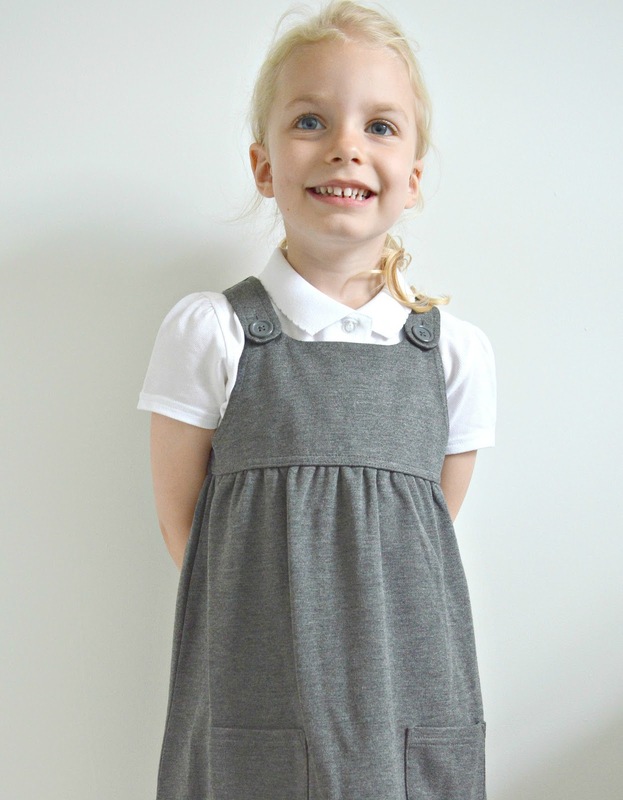 You only turned four in June, so you're going to be one of the youngest in your class - although seeing you in your new uniform makes you look so much older than that. We've got all of your uniform ready; the pinafore dresses, polo shirts, cardigans, socks and school coat and you even have your own P.E. kit. You have such a lovely personality, you're always full of energy and constantly looking for ways to make me laugh. You're such a happy little girl (most of the time!). You're friendly, confident, funny, independent and so much more and I really hope you enjoy going to school and learning new things. You have always loved being around other children, so I know you will love making lots of new friends, as well as developing the friendships you already have. Just the thought of dropping you off at school on your first day makes me so emotional. I'm trying not to think about having to say goodbye and leaving you there, for five days a week. I won't know what to do with myself and the house will be so quiet! Before I go, I will make sure you know where everything is and where to find your peg, so you can hang up your coat every morning. Your new teacher seems really lovely and I'm sure she will help you look for certain things if you can't find them or help you do up the buttons on your polo shirt if you're struggling and I'm not there to help you. I will cherish the time we have as a family on weekends too. I just want you to know how proud we are of you, Sophie Ella. We love you so much and I just want you to know, you will always be my baby - no matter how big you get! I still remember my son starting his first day at school like it was yesterday. It was exciting, worrying and extremely emotional. He was ready for it though and loved every moment and never looked back. He happily settled in without any tears whilst I hurried from there lump in throat and fighting back the tears! Hope it goes well for you and her. She looks so grown up. No idea where the time has gone either we got Blake starting pre-school I don't even think its possible that he is old enough to go. My eldest starts school next year and I can just tell it is going to be really emotional. I think he will be very ready by next September, but I don't think that will be any easier on me. We have this in a few years and I already think that 4 is too young to start. She looks adorable and I'm sure she will have a good start.